Cute Jewellery by Chelsea Doll: Give the Gift! Well, hello there! We've neglected this blog a teeny bit of late, but we can assure you that it's been for a very good reason. Yep, we've been mega busy working on our new pieces and, most importantly of all, some new collections - including the most amazing gift range! We don't like to remind you that Christmas is just around the corner, but unfortunately (or fortunately, if you can get past the panic buying of those special gifts for family and friends, and just enjoy yourself - easier said than done, huh?) it really has crept up on us. Eeek! We like to think that we've done our bit to ease the burden this year, as not only do we have some super-quirky jewellery and accessories, which make exceptionally wonderful gifts, but we've now gone and launched a whole new gift range, which includes amazing goodies like cupcake lip glosses, ice-cream pens and cocktail flavoured body lotion! Items in the range start from £2.50 (with free delivery), so are very affordable - so affordable, in fact, that you may want to treat yourself to some of these beauties! 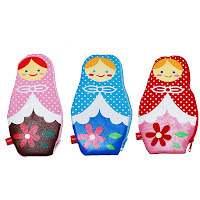 Our favourite items include these gorgeous Russian Doll Pencil Cases/Cosmetic Bags, £7. Available in pink, blue or red, they're such a fantastic way to brighten up your desk or keep your make-up collection together. 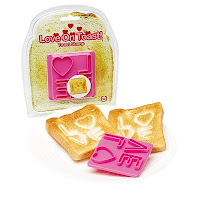 We 'love' this LOVE Toast Stamp, £4, which makes the perfect gift for your loved one. Or you could just keep the stamp yourself and give them toast with a special meaning! 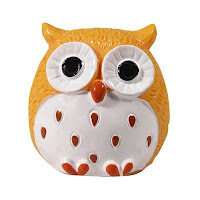 How cute is this Yellow Owl Vanilla Lip Balm? Priced at just £4.50, it's such a cool accessory to carry in your bag. It tastes rather delicious too (try not to eat it though)! Also launched today is a range of Barry M make-up. Check our blog tomorrow, where we'll give you the low-down on this gorgeous beauty range!